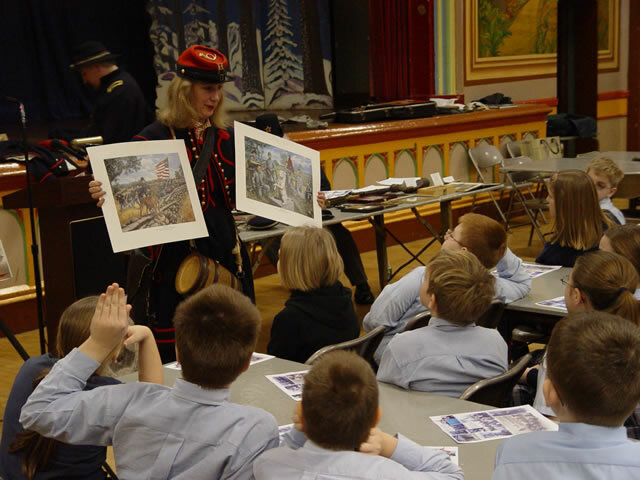 The Greenpoint Monitor Museum "Road Show" St. Stanislaus Kostka School January 23, 2006 Which is the Union and which is the Confederate mascot? How can you tell? Sallie, the Union mascot is on the left. The soldiers wore dark blue uniforms and they are carrying the American flag. Stonewall, on the right, is a Confederate mascot. The soldiers are dressed in gray and are carrying a Confederate flag. Which is the Union and which is the Confederate mascot? How can you tell? Sallie, the Union mascot is on the left. The soldiers wore dark blue uniforms and they are carrying the American flag. Stonewall, on the right, is a Confederate mascot. The soldiers are dressed in gray and are carrying a Confederate flag.